We have encountered such a picture. We don’t know who made it, but great credit to the creator. The picture provides a point that’s so easy to grasp, so hard to follow and so difficult to get people to accept. Is it the gold price in dollars or the dollar price in gold that’s volatile? Does the volatility come from a paper/electronic dollar created at a whim and destroyed by good intention? 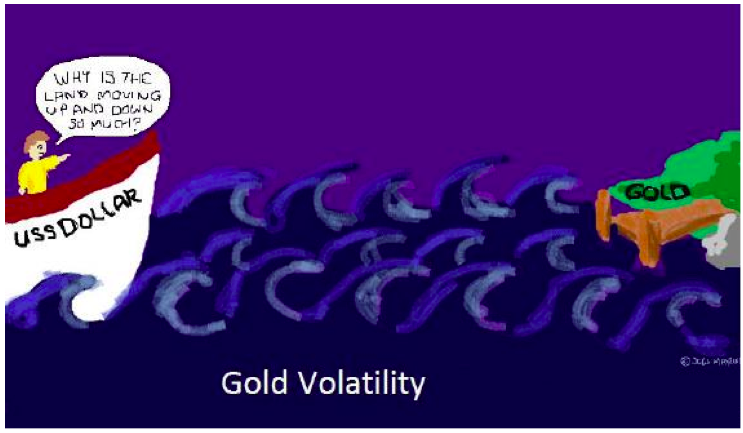 Or does the volatility come from a yellow, heavy and shining metal resting in a vault? One nice thing about this particular picture is that it’s so childish. Indeed, even a child can answer the questions we just asked. It should be obvious to anyone that the majority of the volatility comes from the intangible side. Sure, gold is manipulated by buyers and sellers, like in any market, perhaps only a bit more secretly. But the dollar itself, on the other hand, is nothing but a complete manipulation, 100% dependent on the money masters that have created it. So even if someone would like to manipulate the relatively small gold market in order to make it appear more volatile, they will still have a hard time making it more volatile than the dollar itself. Moreover, the market for gold is a World-wide market, so gold is quoted in many paper currencies, making it very hard to manipulate. Sometimes the dollar bugs seem to forget this fact, as do many people that read the news from such dollar bugs. We don’t, as we quote the major currencies-to-gold every week. “Why is the land moving up and down so much?” Makes sense? What this particular picture doesn’t show is that to the people onboard, the island appears to be rising over time, while the fact is that it’s the sea level that falls. Gold appears to be rising over time, when in fact it’s the dollar that’s falling, continuously losing value. It will continue doing this until the unlimited money creation stops and interest rates are allowed to return to normal positive levels. Until then, we will continue to try to help people to understand the markets by providing a golden perspective on things. We are glad we aren’t alone. At Golden-Markets.com we track the World’s major stock exchanges and currencies in terms of a single currency, gold. © copyright 2011 Golden Markets Ltd. Permission to reprint in whole or in part is gladly granted, provided full credit is given. Read our Disclaimer.